Cameron Mattox, a Delaware Hayes junior and student in the Delaware Area Career Center’s Auto Collision program, sprays a parking meter being refurbished Friday in the Auto Collision lab at the DACC North Campus. 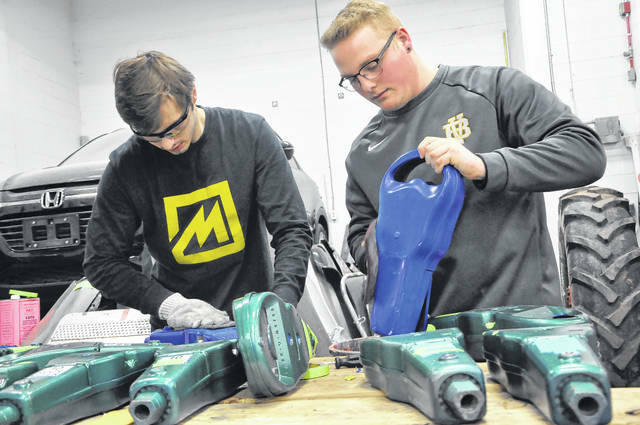 Billy Henderson, a junior from Westerville South, and Levi Rider, a junior from Buckeye Valley, prepare parking meters in the DACC’s Auto Collision lab Friday morning. When the project is completed, students will have refinished 360 parking meters. 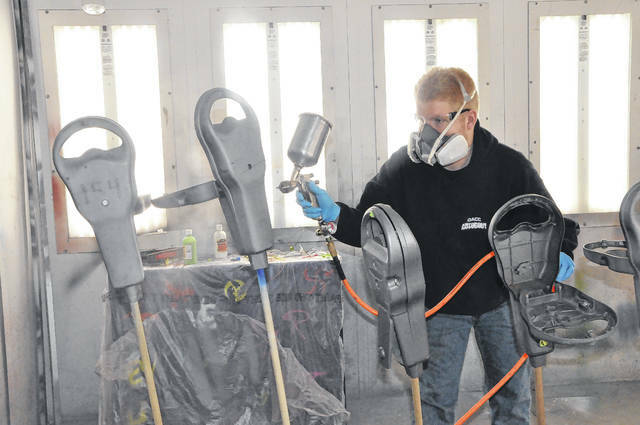 Students in the Auto Collision program at the Delaware Area Career Center have been working on an unusual assignment for the past few weeks, repainting and refreshing all the parking meters in Delaware. David Finnegan, the instructor for the program, said he was contacted by the City of Delaware Police Department and asked if they could repaint all the meters in the city. Finnegan said he was happy for the opportunity and had students begin to prep and refinish the parking meters along with their regular coursework. The students have been working on the parking meters for the last three weeks, Finnegan said. Finnegan added the concept of refinishing the parking meters is essentially the same as the process of refinishing the body of a car and said the project is a great learning experience for his students. Finnegan said the students have already learned a lot about parking meters and have refined their technique and established best practices after the first few batches. The students in the class are also enjoying the project. “It’s the same concept (as auto collision coursework), and I’m enjoying it a lot,” said Levi Rider, a junior from Buckeye Valley. Rider said he’s been focused on making the parking meters as perfect as possible. “I want to make it perfect so the police department can feel happy about it,” he said. Another student in the Auto Collision program, Hayes High School junior Cameron Mattox, said he thinks the project is a unique experience. City of Delaware Police Captain Adam Moore said the project benefits the City of Delaware and the DACC. Finnegan said when the project is completed, the students will have refinished 360 parking meters.